Help to prevent your underwater device from sinking or being lost underwater. Fits a large range of devices with lanyard loops, plus cases and housing. The design enables you to easily bring your device below the surface for that all important shot or view. 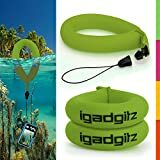 Quick attach and release adaptor so you can fix on and remove your device with ease when back on dry land. Comes in a range of colours that are easy to spot against dark backgrounds. Why buy just one?